Last week Chillingo, the publisher behind many popular iPhone games that was recently acquired by Electronic Arts, released yet another game for $0.99 on the App Store. 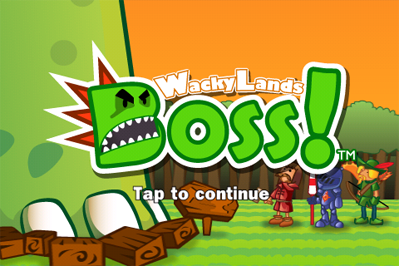 The setting behind WackyLands Boss is quite unusual. Instead of playing a hero, or controlling an army, going after a boss monster, you are the boss. You get to create, customize and equip your own boss, and then go after hordes of heroes. Starting up is extremely easy. You create a new hero and get some money to customize it's look and equipment. There are various head, hand, waist, and foot options, and you can even change some of the basic looks. Then, you start your journey in the first of many areas on the kingdom's map. Moving, attacking, and special moves are done by tapping and swiping. Throughout the game, the player will have the ability to learn new moves, skills, as well as gather gear and money to improve their boss's look. Overall it's an amazingly simple game with nice, stylized graphics, and high replay value. We would especially recommend this to younger kids, as the controls are very intuitive, and the graphics are clearly aimed at them. While it may not occupy more seasoned gamers for long, at that price, it's worth a buy. You can get it now for $0.99.